After a fracture of one of the fingers or metacarpals (bones in the palm), one may notice a bump over where the bone was broken. Like anywhere else in the body, this is a part of the normal healing process. Over time, this bump usually shrinks as the new bone condenses and hardens. Stiffness is a frequent complication of immobilising the hand in a cast. Because we use our hands so much, a lot of the rehabilitation is done through resuming our everyday chores and activities. However, if one is unsure, it is often a good idea to see a physiotherapist to help regain finger motion. Squeezing a small soft ball is useful for regaining hand function as it helps work on finger motion, strength and tactile senses (touch). When bending the fingers, using the other hand to help mould each joint is also useful. 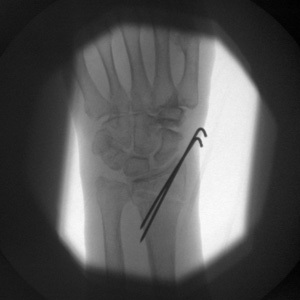 Small metal pins, called K-wires, are frequently used in the hand and wrist for maintaining the fracture in a well aligned position. The wires remain in place for several weeks until the fracture heals. The wires are then usually removed at the clinic. K-wires can sometimes irritate the skin and can become infected. If you notice any blood or pus coming from under the cast, please contact your local plaster room so that this can be evaluated. 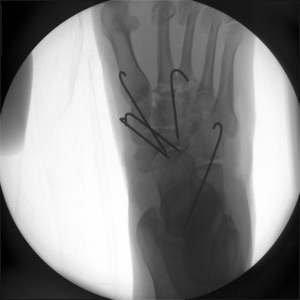 Other methods of fixing fractures in the hand and wrist include metal plates and screws or an external fixator (small metal frame). These are usually reserved for more complicated fractures. Your doctor may discuss these options with you if surgery is required.